Last week was a busy week for Internet Writers, between MLK Day, Trump’s inauguration, and, of course, the U.S. premiere of the first episode of The Young Pope. Today, I’d like to spend a little time going through some harmlessly Silly Takes, perform a quick detour through a truly Rage Inducing Take that is not so much Silly as it is Patently Offensive, and finally, end with a succinct yet wonderful tweet. More of the Silly Takes this week were from conservative sources, but please don’t take that to mean that this project only mocks conservative Takes: everybody is capable of writing Silly Takes. Don’t forget to submit your favorite silly pieces of Internet writing to sillytakes@gmail.com! I didn’t get very many submissions this week, so the pool of potential Silly Takes was mostly limited to stuff I found in my Internet travels. Thanks to Erin for submitting a Take! Anyway, this Take is harmless, but I include it because it’s always nice when a Take is self-aware of its own silliness. You just know that this writer pitched this with a heavy heart and a sudden deep awareness of the many sad duties required of her as an Internet Opinion-Haver. T. Greg Doucette wrote about this piece over at Mimesis Law, and you should probably just read what he has to say about this fatuous, incoherent, and offensive mess of an article. However, if you want to read my opinion (which, presumably, you do, given that you’re reading my blog) it’s here. In short: Karl Spence, who near as I can tell is just Some Jackass, has spent the last thirty years of his life advocating that the only way to stop the massive crime wave in America (that doesn’t exist, at least certainly not the way he describes it) is to bring back swift hangings. In so doing, he ignores the current state of criminal law, statistics, context, and common concepts of decency and due process. He complains about Miranda rights, dismissively describing that case as granting “a right to receive helpful legal advice from detectives whose true job is to solve crimes,” joining the ranks of the many who think that the problem with our criminal justice system is just too much due process. He spends paragraph after paragraph talking about how great vigilantism used to be. He advocates for a constitutional amendment to restore swift executions. “Hang murderers, and every hoodlum in the land will notice” is the sort of thing I’d expect the Sherriff of Nottingham to say, and “[h]ow do you reach those people? With a rope,” is pure masturbatory posturing. As other people have pointed out, this op-ed reads like it was written by Frank Castle. This Take is Silly in the sense that its legal and empirical analyses (as discussed in detail by Doucette, above) are completely divorced from reality, but it’s not Silly in the sense that some otherwise serious people apparently just paid a man to espouse harmful, hateful, inaccurate nonsense about the criminal justice system in a major publication. This is a bad take, and Spence should be ashamed of himself, but the real villain here is the cowardly jackanape at National Review Online who agreed to run this piece. There are always going to be jackboot-fantasists who long for the days when the local constabulary would chop hands off for petty theft, but we don’t have to give them a platform. 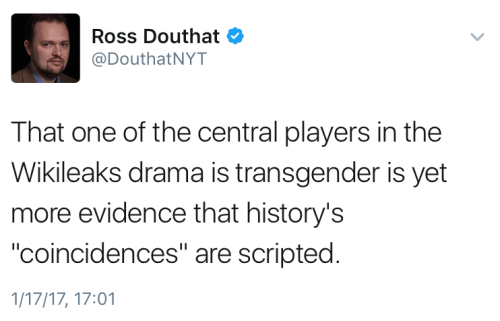 Ross Douthat writes for the New York Times as their Designated Conservative, which means that a lot of people hate him: liberals hate him for being conservative, and conservatives hate him for writing for the New York Times. I would feel more sorry for him if he didn’t say immensely silly things all the time. I have stared at this tweet for a non-trivial number of hours over the last few days, trying to decipher its many mysteries, and I still have no idea what this means. What is the “coincidence?” Who is scripting history? Is he suggesting that Chelsea Manning is a member of the Illuminati? Many people expressed confusion, but Douthat refused to clarify what this means in any follow up tweet or, to my knowledge, any writing since. Douthat, like any good performance artist, knows that the work needs to speaks for itself. This, friends, is everything I want in a Silly Take. It’s an off-the-cuff response to a current event that is intended to really make you think, man, about the way the world works. It even uses scare quotes. It doesn’t make a lick of sense. It’s equal parts confusing and offensive. This is perfection in Take Silliness, ladies and gentlemen. We may never see such a perfect specimen again. Congratulations to Ross Douthat for writing the Silliest Take of the Week, and winning a special place in my heart.